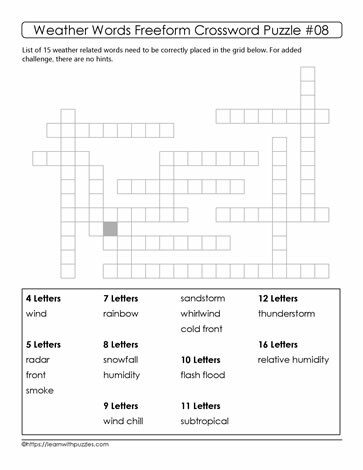 This crossword weather puzzle draws upon students' visual-spatial and language skills to complete the puzzle. To solve this crossword, place the list of words in the correct set of blank squares in the grid. One letter hint is provided. These puzzles provide vocabulary building support, consolidation of spelling and problem solving skill development as puzzle solvers work to complete the challenge!